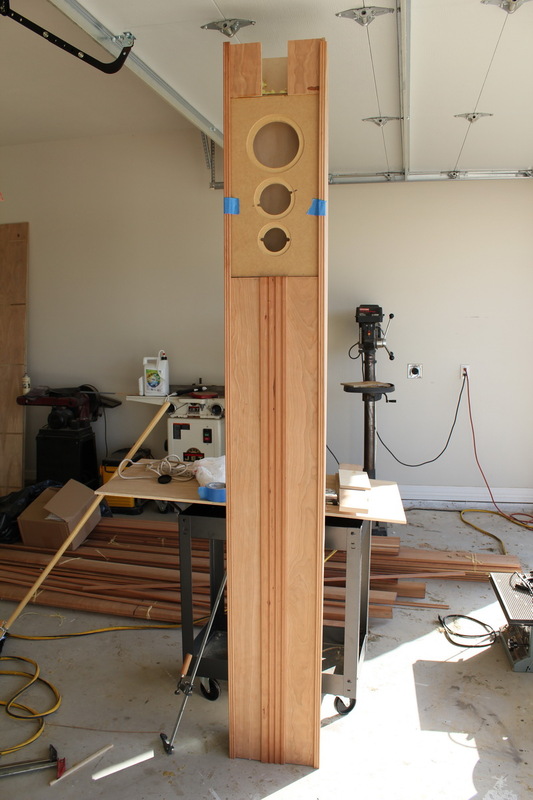 The side surround speakers are simple sealed boxs built into the decorative columns along the side walls. These utilize the Dayton Reference 7”, the Dayton Reference 2” dome, and the Dayton Reference 1” dome tweeter with a passive crossover. Very unremarkable in design but the quality of the Dayton Reference series drivers is superb. While these are no match for the main line arrays or CBT center, I have found them to be easily adequate to do the job. It has been suggested that an inverted ground plane CBT (ceiling plane CBT) would be an ideal surround speaker and this is probably true but probably unnecessary. The rear speakers are equally unremarkable in design. 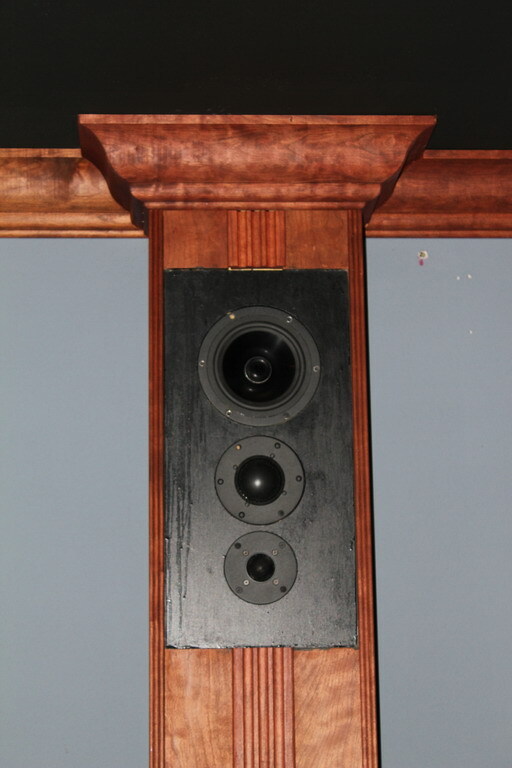 These were built using the Dayton Reference 6” driver and 1” dome tweeter in Dayton 0.5 ft^3 pre-fab boxes. Again the performance of the Reference series drivers make these superb speakers for the application. 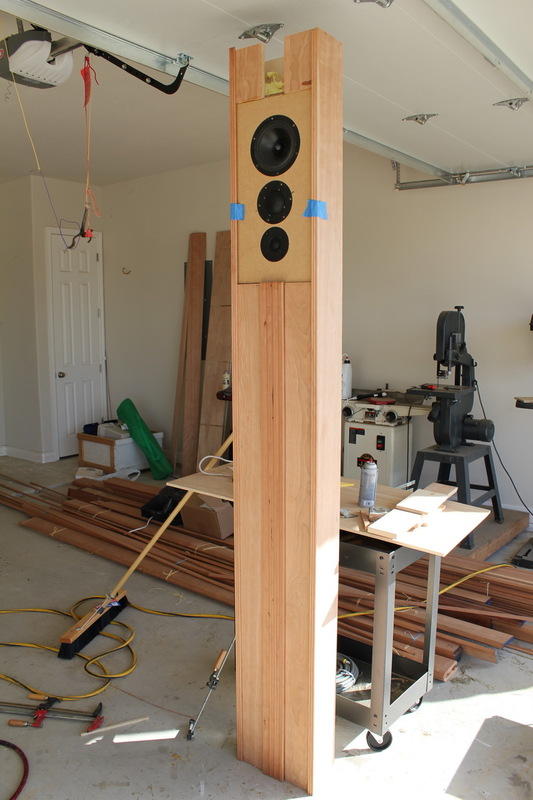 In all there are six surround speakers, two pair of sides and one pair of rear. These are driven by an Usher Audio R-6.0 125 watt x 6 channel amplifier. Because the original Anthem P2 processor does not have true HD built in and because it has only 5.1 inputs for external processing, the system operates as a 5.2 system. The side surrounds and the rear are all the same signal. Since everything has it's own amplifier channel it will be an easy matter to convert to 7.2 or even 9.2 in the future with a processor upgrade.